Dr. Zhifu Gao, vice professor from Pulsar Team, Xinjiang Astronomical Observatory (XAO) and his collaborators have made a new breakthrough on the rotational evolution of magnetic stars. The result is published on international core journal MNRAS (2016, 456,55-65). Megnetars are a kind of pulsars powered by their magnetic energy. Due to the strong timing nose and transient radiation, it is hard to measure the braking indices of magnetars. 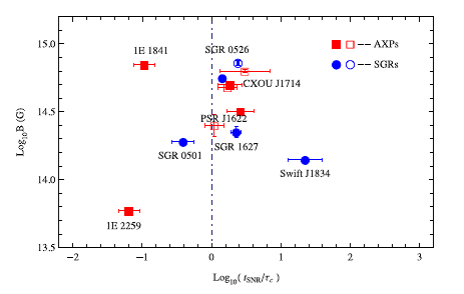 Using the method that the true age of a magnetar is the same with the age of its associated supernova remnant (SNR), researchers estimated the values of the mean braking indices of eight magnetars with SNRs, which cluster in the range of 1–42. 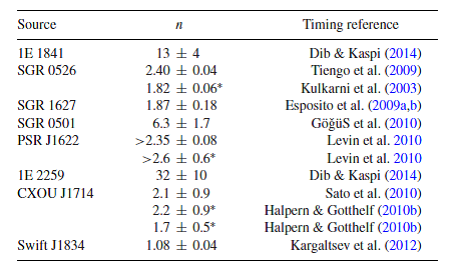 They interpreted smaller mean braking indices of 1 < n < 3 for five magnetars within a combination of the magneto-dipole radiation and wind-aided braking, and interpreted larger mean braking indices of n > 3 under an updated magneto-thermal evolution model. 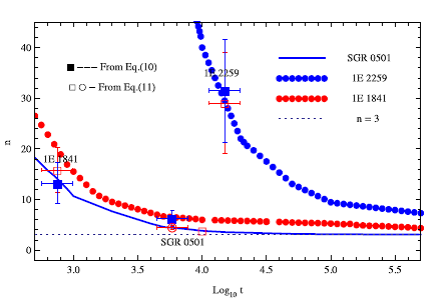 As a result of the uncertainties in the SNR ages due to distance uncertainties and the unknown conditions of the expanding shells, the researchers provides an effective way to constrain the magnetars’ braking indices, and their results will help people get a deeper understanding of the universal rule of magnetar braking. The braking indexes of eight magnetars are from Table 1 of“The McGill Magnetar Catalog”, the data marked with asterisk (∗) are from Table 2. Blue circles and red squares represent SGRs and AXPs，respectively.